This article was originally published in the Jan 15-21, 1995 issue of The Sunday Observer. The Indian National Congress that ruled the state then had a tumultuous time with three chief ministers, Veerendra Patil, S.Bangarappa and M. Veerappa Moily ruling the state. In the elections held in 1994 December, Janata Dal won and H D Devegowda became the Chief Minister. 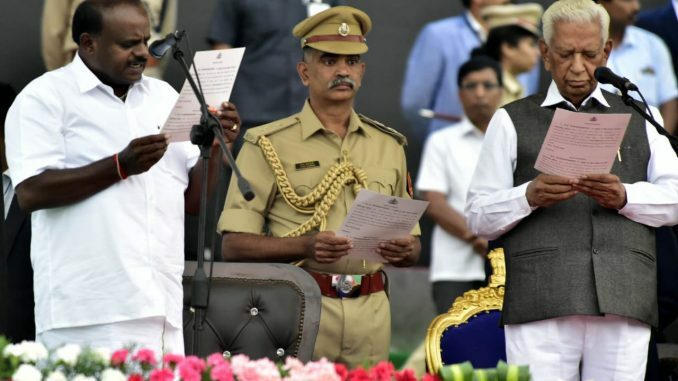 The recent outcome of the Karnataka Assembly elections in which the ruling party Indian National Congress (INC) was thrown out and the Janata Dal (JD) was brought back to power has been interpreted (and hailed) as an indication of – and attainment of democratic maturity by the Indian voter. —If that is the case, how can we describe the success of Janata Dal? The party was wiped out in the last election and its own leaders admit that they did not perform responsibly while sitting on the Opposition benches. —If that is the case how can we describe the success of Bangarappa and nine of his followers when his government was considered as the fountainhead of corruption? The simple (and honest) truth is, Karnataka’s voters have thrown out the Twiddledee and brought back the Twiddledum. It is not that they did not have a choice. There were any number of independent candidates. Voters could have elected them to show their anger at and frustration with professional politicians. My own experience of contesting the election from the Chamaraja constituency of Mysore City as an independent candidate and losing the election by a big margin proves my hypothesis that Indian voters are not interested in elections, do not care who wins and often do not even know whom they are voting for. One retired Karnataka Administrative Service official who wanted to vote for me changed his mind at the last minute to vote for a candidate because, on his way to the polling booth, that candidate’s people gave him his voting registration number! In my constituency, there were eight major slum areas and the votes there were controlled by petty feudal lords, usually small time politicians. They are not influenced by what the policy of liberalisation is doing to the economy, whether poor are getting kerosene regularly, whether the condition of roads is good or in what way the reservation policy will affect our educational institutions in the long run. They are swayed by how much money they will get or what position they can secure after the election. I was hopeful that their votes would be more than neutralised by the active participation of literate and educated voters in my constituency. But my hopes were belied. I had contested in the assembly election in 1989 also from the same constituency and secured just 550 votes. This time I could get 2260 votes. The surprising thing was that even many of my supporters were shocked by my defeat. When I contested the election in 1989, I was not known in the city. I had returned from the US in 1987 where I had stayed for more than 22 years. But in 1994, the situation was entirely different. With the help of many leading intellectuals, scientists, professionals, retired army officials and bureaucrats, I had taken interest in solving every significant problem faced by the citizens in Mysore. During the campaign I did not want to match my political opponents in terms of spending money. While they spent any where from Rs 7 lakhs to 20 lakhs (despite the much publicized observance of the model code of conduct of T N Seshan), I spent less than Rs. 14,000. But with the help of friends, we were able to visit more than 30,000 houses and talk to more than 70,000 people. We did not just ask them for votes. We spent some time in each house and discussed the problems faced by them. Thousands of voters had promised to vote in my favour after understanding why I was contesting. If just 50% had kept their promise, I would have easily won. As a part of the campaign, I had published a booklet Decline and Fall of Mysore: Who is Responsible? I was able to sell more than 3,500 copies of that booklet. Some who read that booklet voluntarily came forward to help me in the campaign. The message in that booklet was clear. Unless literate and educated people take interest in politics, we can not improve living conditions in city. 80% of the voters in my constituency were literate and between 40 -50 % of them read news papers and were reasonably well-informed. My strategy was to concentrate on this literate body and to take my message to them. I also spent a lot of my time with members of Rotary, Lions and Round Table clubs, industrialists, employees of leading industries, shopkeepers, educationists, medical and engineering students among others. This is after all the segment of the society which is capable of understanding how professional politicians are duping them. This is also the segment of the society whom, purportedly, I could easily communicate with and convince of the need to bring about a revolution in our political system. I was obviously wrong in my assumption. A shopkeeper was frank enough to admit that if we really root our corruption he would not be able to earn his living! For the sake of argument and to show others how moral we are, many of us may talk against the present corrupt system. But many of our traders and industrialists have learnt the art of managing the system and continuing to make money. They may even agitate for unification of taxes and show anger against the political system which is bringing all kinds of irrational rules and regulations. But in the final say, they prefer a system where they can bribe and manage rather than one where the rule of law prevails. When the average percentage of voting in the whole of Karnataka was around 65%, my constituency which has among the highest percentage of literate people managed to post the lowest percentage of voting: 52 percent! In other words, our literate class which should be able to vote taking into consideration the merits of the candidates did not even bother to perform their duty and betrayed their city. There was greater participation of voters from slum areas rather than from better neighbourhoods. I was hoping that since the literate class is fully familiar with the lack of a well-defined election agenda on the part of political parties and lack of determination to implement what little they have, not only they would canvass for me but would publicly come forward and endorse my candidacy. But for a handful of well-known Mysureans, others were hesitant to come forward to support me publicly. Most of the leading intellectuals had privately assured me that I could depend upon their support and votes. Ironically most of those who had publicly supported me could not finally vote for me because their names were missing from the voters’ list. Is this just accidental or is there a sinister design? Valuing the party over candidate! I also observed another interesting phenomenon during my campaign. While all the people living in slum areas were registered, many people especially (the principal of a medical college and a retired judge to name just two) who had transferable jobs often are not registered. The attitude expressed by some sympathisers of the Bharatiya Janata Party clearly shows how immature we are as far as democracy is considered. Some of them did not even know who the BJP candidate was but that did not bother them. A few even told me that they would vote for the BJP even if the candidate was worthless. Some of them assured me the vote after hearing my name. They had assumed that I was the BJP candidate. Even many educated voters did not know what was expected of their legislators. One doctor assured me of her vote if I could get two dustbins by the side of her house. Another housewife wanted my assistance that once elected I should come and clear the garbage in front of her house. Many were going to vote for certain candidates because they had received certain favours like getting admission for their children, or sites. Very few were aware that a legislator should try to bring about a systemic change by enacting the right kind of legislation so that all are benefited, so that the rights of minorities are protected, so that society as a whole prospers. With one exception, all newspapers completely ignored my candidacy. Even when I was prepared to pay, one newspaper was hesitant to accept my advertisement and I had to make many calls before I could buy space. No newspaper bothered to find out and publish what the stands of different candidates on various important issues were. When a candidate-public meet was held for the first time and many professional politicians could not answer questions from the public properly, only one newspaper bothered to cover this important experiment. The most significant revelation newspapers could make was that voters would vote along caste lines! If that was indeed the case, being the only prominent Brahmin candidate from my constituency, where there are more than 20000, Brahmins, I should have got many more votes. Dr. Bhamy V. Shenoy, an alumnus of IITM is advisor to Pratham Mysore, former governing council member of Manipal Institute of Technology, current governing council member of Nitte and an international oil expert. He is also former working president of Mysore Grahakara Parishat. Nothing has changed since 1994.2018 has only repeated the same story. How can the constitution value only numbers to form government formation & not value the mandate of people. JDS got 38seats mainly because they promised complete farm waiver. Which ever parties join hands to form government should agree to fulfil all promises made to people to form government.